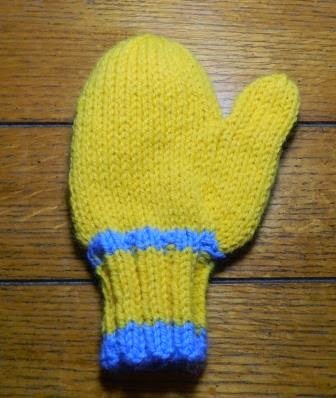 Three patterns, four mittens and I think that I’ve finally made a mitten that will fit a five year old. 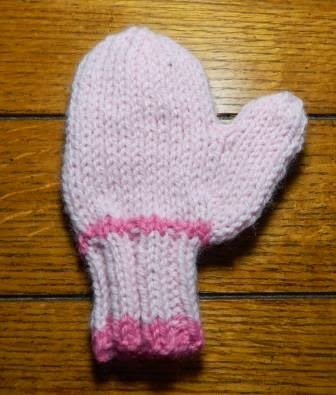 I have been envisioning supplying mittens to children in kindergarten ever since I first read the The Mitten Tree . I finally have the luxury of time since I retired from full time job. Mitten Number 1 is the Toddler size from the Snowy Day sets by Leisure Arts that I used to knit the hat I wrote about in this blog post. So, How old is a toddler? I usually think of 2-3 years of age. This one looks to wide to me for a 2-3 year old. I followed the pattern using U.S. size 6 and U.S. size 8 needles and Plymouth Encore Yarn worsted . The pattern says that the finished measurement is a 5 1/2 inch palm circumference and a 6 inch length. Mine came out 5 3/4 inch circumference and 6 inches in length. 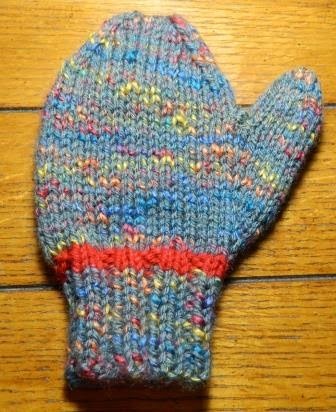 Mitten Number 2 is from Easy-Knit Mittens . A good pattern book, it has patterns in all sizes and gauges. This one is knit using the pattern for 5-7 year olds. The pattern calls for U.S. size 5 and U.S. size 7 needles. This one I knit in Vanna’s choice worsted weight yarn by Lion Brand. I didn’t like the instructions for the top so I changed it to be similar to the instructions I use for sock toes. Here’s how I finished the top. The pattern says that the finished measurements are 6 1/4 inch palm circumference and 7 inch length. Mine came out at 6 3/4 inch circumference and a 7 inch length. Definitely closer to fitting a 7 year old not a 5 year old. Also, this yarn knit to a different gauge than the Plymouth Encore. Mitten Number 3 is the start of the child size mitten from Snowy Sets. I did the ribbed cuff in size 6 as the pattern calls for but used size 7 for the hand. This is also a Vanna’s Choice yarn. As you can see I chose not to finish this one. I should know better than to use self striping yarn for a project like this. The colors just don’t work. I did, however, learn that I definitely need to use size 7 needles to get the width that the pattern calls for. So I left it and moved on to Mitten number 4. 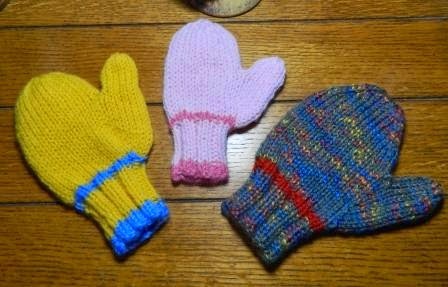 On Monday, I took these mittens to my current school and asked a few kindergarteners to try them on. 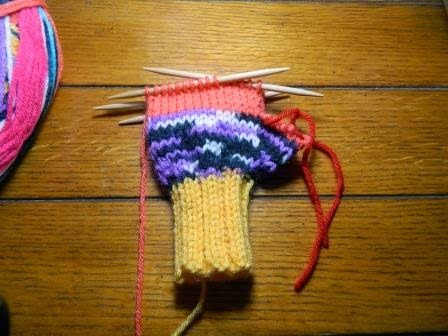 Mitten Number 4 is the one that is the correct length and width. I’ll be sticking with Plymouth Encore Yarn worsted for these mittens from now on. It is my favorite wool/acrylic blend. Lots of colors, good stitch definition, and machine washable and dry with a good texture. So now I’m off to knit the second mitten for each of these and then I’ll send them out into the world to keep some little hands warm this winter.